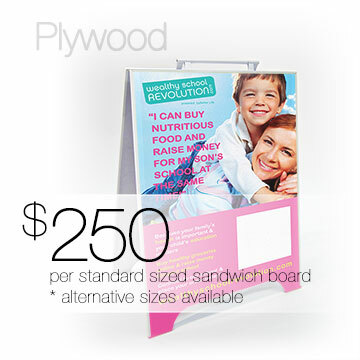 Metal A Frame sandwich boards consist of a metal stand and 2 separate coroplast inserts. This option gives you the added flexibility of changing the advertising message periodically, without replacing the entire frame. Once you are ready for a new promotion, simply pull out the existing boards and slip in the new ones. This is a cost effective solution to always keep your message fresh and new. Coroplast Sandwich Board inserts are weather proof as well. 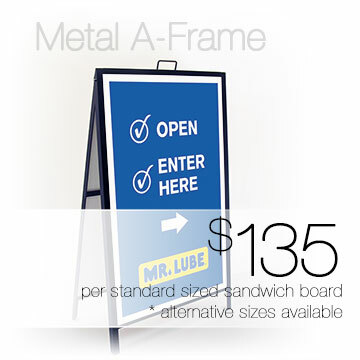 *Metal A Frame signs are available in the following sizes: 18″x24″, 30″x24″, 32″x48″, and 24″x18″. Plywood sandwich boards are recommended for their durability to survive Vancouver weather conditions. Plywood ensures there is no warping during any of the seasons, and due to the heavier weight, they are more likely to withstand heavy rain or wind. The standard option of 24″x32″ is available for $250 ea. Step up your marketing game with our beautiful transit and bus-stop ads printing services.